The Seattle Waterfront Project is waiting on a “special” study from the City of Seattle as plans proceed for the waterfront’s redevelopment. As outlined in Schwabe’s first article on this topic, the City has finished a feasibility study—released last August—that generally estimated the benefits related to the project’s Local Improvement District (LID) assessment. Now, the City will be conducting a more detailed special benefit study to determine the exact LID boundary and the “before” and “after” values for each property within the boundary. The City expects to finish this special benefits study by March, followed by a Seattle City Council vote to form the LID by October 2018. What’s So Special About Special Benefits? A special benefit is the difference (i.e., increase) in fair market value of the individual property immediately before the public project and immediately after. The Seattle Waterfront Project’s special benefit study will require a more focused parcel-by-parcel analysis of all properties within the study area. The City’s appraiser will conduct the preliminary special benefit study to determine the “before” and “after” property values. One major assumption in the study is that the Alaskan Way viaduct has been removed during the “before” analysis, which means that any enhanced views or other related changes (such as reduced noise, improved air quality, etc.) from removal of the viaduct will not be considered “special benefits” of the waterfront’s redevelopment. Benefits will be based on such criteria as proximity to the waterfront’s amenities and improved transportation corridors. But the special benefit for each property as determined by the City’s appraiser is not the same thing as the LID assessment that the City will ultimately impose. The LID assessment will be limited by three statutory-based criteria. First, the total assessment cannot exceed the total project cost, which the City currently estimates will be $688 million. Second, the total assessment collected cannot be more than the total special benefits. And third, an assessment imposed on one property must be reasonably proportionate to the special benefit conferred on that property from the public project and to the assessments of other properties that are similarly situated. Although the special benefit study is not expected to be completed until early 2018, property owners, managers and tenants should be prepared for what is on the horizon. How the study interprets exact proximity to new amenities, historical use designations, and zoning considerations could significantly influence the difference between a 1% market value increase and a 5% increase. Property owners and tenants within the LID area should begin considering such implications for current and future leases, and whether the LID assessment will be captured as part of a lease’s operating expenses. A fully redeveloped Seattle Waterfront may seem like a ways away, but now is the time to pay special attention to what’s ahead. The benefit analysis is segregated into geographic study areas identified as areas A, B, C, D and E, as well as the non-geographic Residential Condominiums. The map depicts the location of the study areas and below is a brief summary of the key characteristics and early estimates for these study areas. Key Characteristics—One of the most directly impacted portions of the proposed LID. This area is more developed than others are with maritime property, public parks/piers, and retail. Study Area A will specially benefit from the Promenade and Overlook Walk/Pike Place Market connections improving pedestrian connections and open space aesthetics. Estimates—Estimated market value increase between 2% and 5% depending on location, land use, and historical designations. Key Characteristics—Special benefits from park extensions and streetscape upgrades for more welcoming and navigable connections to core areas of the surrounding neighborhoods (Pioneer Square, Waterfront, Yesler Way, Downtown Mixed Commercial/Office Core/Retail Core, and Belltown). 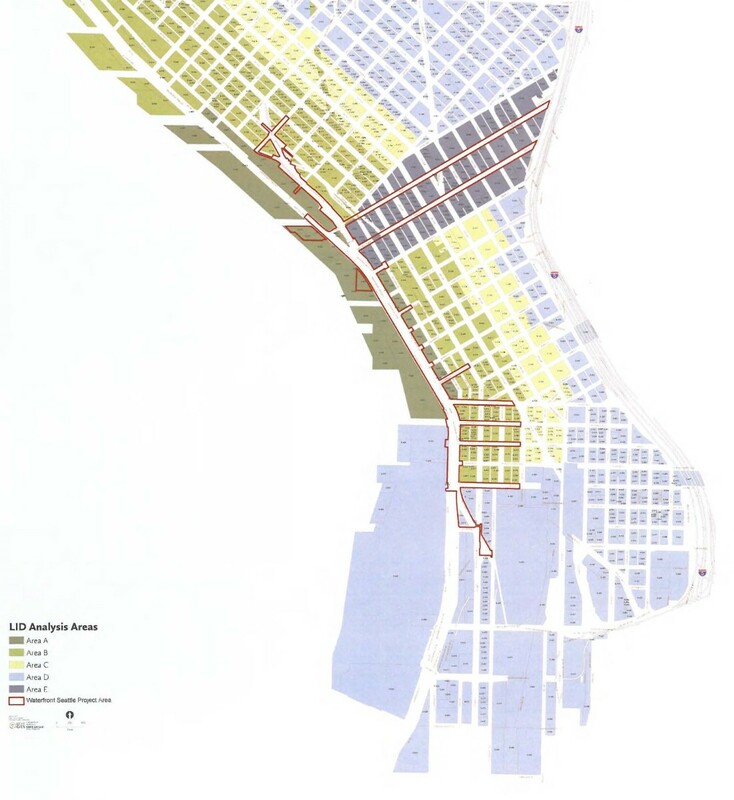 The Pike Place Market property has zoning limitations and other factors such as affordable housing requirements that impact special benefit estimates. Key Characteristics—Despite being farther east from LID improvements in comparison to Study Area B, Study Area C will likely still specially benefit from streetscape upgrades for more welcoming and navigable connections to core areas of the surrounding neighborhoods (Pioneer Square, Waterfront, Yesler Way, Downtown Mixed Commercial/Office Core/Retail Core, and Belltown). Estimates—Estimated market value increase of nominal to 1%. Key Characteristics—Represents the outer limits of the potential LID boundary and demonstrates the lowest level of project impact/benefit. Key Characteristics—Special benefits from cohesive updated streetscape build-outs along major arterial roadways incorporating new wider sidewalks, public seating, and extensive landscaping with bike facilities and improved signage. Higher benefits around the Overlook Walk element of the project. Estimated special benefit is impacted by historical use designations, zoning and proximity to the waterfront. Estimates—Estimated market value increase between 2% and 5%. Key Characteristics—No specific geographic location for the estimated 8,000+ individual condominiums within the initial LID study area. The area is now experiencing a strong developer/sellers’ market with unmet demand. General conclusion is that a Seattle waterfront park will likely have a positive impact on residential property values and that the most benefit is evident within a 2-3 block radius.